"I feel very confident that my device keeps me safe. I especially like it when I shower. My family are glad that I have it. I gives them peace of mind." "I have been a member for about 2 weeks and I have found that Mobile Help is very prompt on returning a call or checking to see if you are O.k. I tripped my alarm and did know that I had so I did not call them and shortly they were at the door, and in one case entered the house. I am very satisfied with MobileHelp." "Everything arrived quickly and has worked well. The necklace is light and easy to wear. The microphone is small and easy to keep in its leather case in my purse. I'm sure, if I ever need it, you'll be there to take care of me." 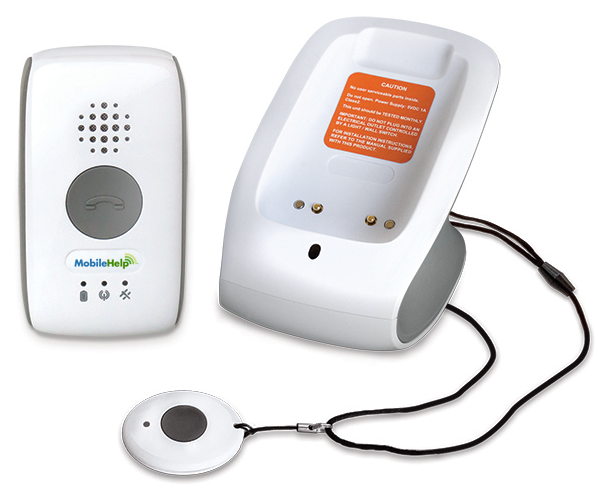 With medical alert systems starting at $19.95, MobileHelp provides peace-of-mind with 100% US-based Emergency Monitoring. MobileHelp offers the highest quality of affordable mobile medical alert systems, empowering members to live an active life, at home or away, in all 50 states. The first company to offer a mobile medical alert system, MobileHelp proudly holds an A+ rating with the BBB. 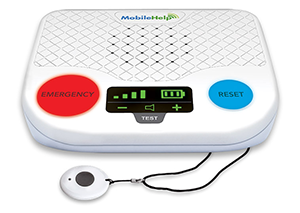 MobileHelp medical alert systems utilize cellular network connectivity and GPS technology, providing protection to members everywhere they go where cellular networks are available. 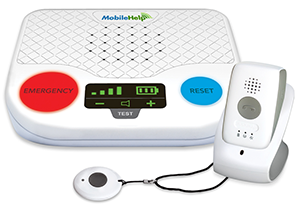 The MobileHelp Fall Button ™ can automatically detect a fall and signal for help, even if the member is unable to press the button. Signature programs such as Connect Premium provide lifetime savings, a price guarantee, and protection against lost equipment. MobileHelp is an FDA-registered company with the mission to “be someone’s hero, every day". We will ask You for certain kinds of personal information, such as Your name, email address, street address, telephone number, and other information that identifies You as an individual (“Personal Information”) to provide the Products You request. All payment information we collect, credit card, debit card or bank information, for ongoing billing of the service is encrypted. 3.1 We do not share, sell or trade Your Personal Information with any third parties, except with Your consent or as described herein. 3.2 We may disclose Your Personal Information when legally required to do so, to cooperate with law enforcement investigations or other legal proceedings, to protect against misuse or unauthorized use of the Website, to limit Our legal liability and protect Our rights or to protect the rights, property or safety of Users of the Website or the public. 3.3 We may also disclose Your Personal Information to outside individuals and/or companies that help Us bring You the Products We offer and to create, operate, and maintain Our Website. For example, We may work with third parties to: (a) manage a database of customer information; (b) assist Us in distributing emails; (c) assist Us with direct marketing and data collection; (d) provide data storage and analysis; (e) provide fraud prevention; (f) provide customer service; (g) provide product fulfillment and shipping services; and (h) provide other services designed to assist Us in developing and running Our Website and maximizing Our business potential. We require that these outside companies agree to keep all information shared with them confidential and to use the information only to perform their obligations to Us. We authorize certain service providers to utilize for their business purposes and in accordance with their privacy policies certain aggregated, information derived from data collected when You use the products and services they support on Our behalf to customize their customer base. This aggregated products information does not identify You personally. 3.4 We may participate in third-party cooperative databases. Database participants provide customer names, and mailing addresses and information about their customers' purchasing history to the database which allows the database participants to segment and/or obtain access to potentially interested parties to whom or which they may target their promotions. 3.5 In addition, if We go through a business transition, such as a merger, acquisition by another company, or sale of all or a portion of Our assets, Your Personal Information will likely be among the assets transferred. 3.6 Our Website may allow Users to post testimonials and other content to Our Website. Any Personal Information that You post to Our Website will become public information and will be accessible by other users of the Website. In addition, Your user name will be viewable by other users, and We therefore encourage You to use a user name that is not Your actual name. We have no responsibility to maintain the privacy or security of any such Personal Information that You may choose to post to Our Website. 4.1 Through Your use of the Website, We may also collect certain non-personally identifiable information from You (“NPII”). NPII is not associated with You as an individual. It is measured anonymously and only in the aggregate. 4.2 We may also use “pixel tags” (sometimes called “Web beacons” or “clear gifs”), which are tiny graphic images, on the Website. Pixel tags help Us analyze Users’ online behavior and measure the effectiveness of the Website and Our advertising and marketing. We may also use other analytical tools to evaluate site performance through the use of aggregated data, which contain no Personal Information. We work with service providers that help Us track, collect, and analyze this information. 4.3 Cookies, pixel tags, and/or other analytical tools that We may use on the Website may collect information about Your visit, including the pages You view, the features You use, the links You click, and other actions You take in connection with the Website. This information may include Your computer's Internet protocol (IP) address, Your browser type, Your operating system, date and time information, and other technical information about Your computer. We may also track certain information about the identity of the Website You visited immediately before coming to the Website. We do not otherwise track any information about Your use of other Websites. 4.4 Cookies, pixel tags, and/or other analytical tools in Our emails may be used to track Your interactions with those messages, such as when You receive, open, or click a link in an email message from Us. 4.5 We may also work with businesses that use tracking technologies to deliver advertisements on Our behalf across the Internet. These companies may collect information about Your visits to the Website and Your interaction with Our advertising and other communications, but no Personal Information is shared with them. 4.6 We may combine the NPII collected through cookies, pixel tags and other analytical tools with other information We may have collected from You. This information may be used to improve Our Website, to personalize Your online experience, to help Us deliver information to You, to determine the effectiveness of advertising, and for other internal business purposes. 5.1 We strive to keep Your Personal Information private and safe. We take commercially reasonable physical, electronic and administrative steps to maintain the security of Personal Information collected, including limiting the number of people who have physical access to database servers, as Well as employing electronic security systems and password protections that guard against unauthorized access. In addition, it is Our policy to never send Your credit card number via email. Please note that email is not encrypted and is not considered to be a secure means of transmitting credit card information, so please do not send Us Your credit card number by email. 5.2 Unfortunately, despite Our best efforts, the transmission of data over the Internet cannot be guaranteed to be 100% secure. While We will use every reasonable means to ensure the security of information You transmit through the Website, We cannot guarantee that such information will not be intercepted by third parties. We will, however, prosecute any unauthorized or fraudulent transactions to the fullest extent permitted by law. 6.1 While visiting the Website, You may link to Websites operated by third parties or You may have come to the Website using a link found in another Website. Such other Websites are independent from Us, and We have no control over, or responsibility for, their information, products or activities. 6.2 In addition, We currently use third parties for payment processing of Your order(s). Such payment processors are independent from us, and We have no control over or responsibility for their information, products or activities. If You do not want to receive emails, mailings or phone calls from Us, You may opt-out in any one of three ways: (i) email Us at privacy@mobilehelp.com to request that You be unsubscribed; (ii) mail Us a letter requesting that You are unsubscribed to Us at 3701 FAU Blvd., Suite 300, Boca Raton, FL 33431 and include Your name and email address in the message; and/or (iii) call Us toll free at 1-800-761-6539, provide Your name, address, phone number and email address, and request that You be unsubscribed. Please allow Us the (10) business days from when the request was received to complete the removal, as some of Our promotions may already have been in process before You submitted Your request. A common Internet scam is known as “spoofing” or “phishing.” This occurs when You receive an email from what appears to be a legitimate source requesting Personal Information from You. Please be aware that We will not send You any emails requesting You to verify credit card, bank information, or any other Personal Information. If You ever receive an email that appears to be from Us requesting such information from You, DO NOT respond to it, and DO NOT click on any links appearing in the email. Instead, please forward the email to Us at privacy@mobilehelp.com, as We will investigate instances of possible Internet fraud. 10.1 Under California Civil Code sections 1798.83-1798.84, California residents are entitled to ask Us for a notice describing what categories of Personal Information We share with third parties or corporate affiliates for those third parties or corporate affiliates' direct marketing purposes. That notice will identify the categories of information shared and will include a list of the third parties and affiliates with which it was shared, along with their names and addresses. If You are a California resident and would like a copy of this notice, please submit a written request to the following address: privacy@mobilehelp.com. Please allow 30 calendar days for a response. We allow the collection of Users' behavioral tracking (but not Personal Information) by third parties. We do not authorize the collection of Personal Information on the Website by third parties. The Health Insurance Portability and Accountability Act (“HIPAA”) sets forth privacy and security standards for any entity that uses or discloses protected health information. For information on HIPAA, visit the U.S. Department of Health and Human Services Website at www.hhs.gov. HIPAA compliance is an organization-wide obligation requiring procedural standards and business practices that protect the privacy and security of patient/client information. As part of these obligations, the business must ensure it only utilizes software that has adequate safeguards to protect patient/client information. Our system incorporates such technological and procedural safeguards, as detailed below. We employ the following technological safeguards to facilitate compliance with HIPAA: patient/client information is transferred using 168-bit SSL encryption; accounts require secure login with minimum password length enforcement; the production environment is protected by stand-alone firewalls with access limited to authorized personnel via encrypted channels; and offsite backups are made daily and stored in an encrypted state. Further, We require all personnel with access to patient/client information to be trained in the privacy requirements of HIPAA. We do not share, sell, disclose or provide patient/client information to third parties unless required by law. We also provide numerous settings and features including user-specific login, multiple user access levels, and the ability to easily add and remove users to facilitate procedural standards that enable Us to maintain overall HIPAA compliance. If You have any questions about Your privacy or security at the Website, please send an email to privacy@mobilehelp.com and include Your name, phone number and email address in the message. If You do not receive a response from Us to any emails You send to Us within 7 business days, please send Us another email as Your original email may not have been received. By accessing this website, you are agreeing to the following terms and conditions and all applicable laws and regulations, and agree that you are responsible for compliance with any applicable local laws. Unless otherwise stated, the materials, text, and images are property of MobileHelp, and are protected by applicable copyright and trademark law. This license shall automatically terminate if you violate any of these restrictions and may be terminated by MobileHelp at any time. Upon terminating your viewing of these materials or upon the termination of this license, you must destroy any downloaded materials in your possession whether in electronic or printed format. The materials on MobileHelp's web site are provided "as is". MobileHelp makes no warranties, expressed or implied, and hereby disclaims and negates all other warranties, including without limitation, implied warranties or conditions of merchantability, fitness for a particular purpose, or non-infringement of intellectual property or other violation of rights. Further, MobileHelp does not warrant or make any representations concerning the accuracy, likely results, or reliability of the use of the materials on its Internet web site or otherwise relating to such materials or on any sites linked to this site. The information on this site is free of charge and for informational purposes only. It does not create a business or professional relationship between you and MobileHelp, other than what is explicitly outlined under the Contract Terms and Conditions upon the purchase of MobileHelp Medical Monitoring Service. Links on this site may lead to services or sites not operated by MobileHelp. MobileHelp has not reviewed all of the sites linked to its Internet web site and is not responsible for the contents of any such linked site. The inclusion of any link does not imply endorsement by MobileHelp of the site. Use of any such linked web site is at the user's own risk.